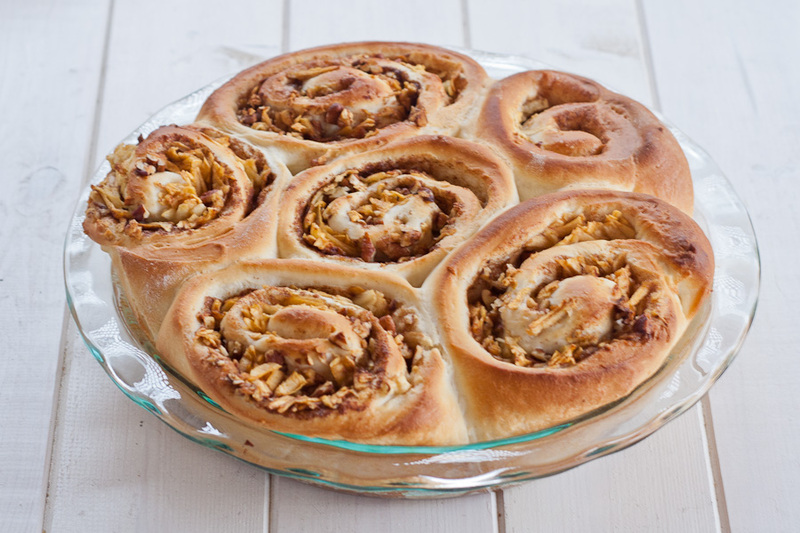 Not a big fan of cinnamon rolls, but I thought I should give this recipe a chance, the combination of apples and pecans promised to turn something boring into delicious. Well it did, but I’m still not a fan :P, I mean I take chocolate over bread every time. 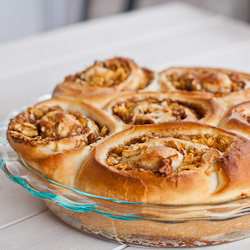 However for the passionate out there this is a really good thing, very tasting no doubt about it and not very complicated than your usual cinnamon rolls recipe. Enjoy! In a bowl, add 1 cup warm water and 2 tbsp yeast and whisk until the yeast dissolves. Pour the oil and sugar, mix together and let it rest for about 5 minutes. If the yeast is good, the mixture should make a lot of bubbles. Now add the egg as well and mix again. Now add your 1 tsp of salt and those 3 cups of flour. If the dough is too sticky though, add a bit more flour. When you are satisfied with the result shape the thing into a ball and let it rest for 20 minutes or so. While you wait for the dough is time to get everything else ready. You’ll need 2 apples, peeled, cored and shredded. Also mix 1 cup brown sugar and 1 tbsp cinnamon in a small bowl. … and chop the pecans, as big as you want them. Turn the dough over onto a floured surface and roll it into a long rectangle that’s about ¼ of an inch (0.6 cm) in thickness. Melt some butter in a small bowl and brush the dough to cover the entire surface. Next sprinkle the brown sugar and cinnamon… place the shredded apples as well… and end with pecans. Now it is time to fold this thing and shape our future rolls. Cut the roll into pieces about 1½ inches (4 cm) in thickness. I used two 9 inch (23 cm) pie dishes but you can definitely choose your own thing. Butter your dish very well, arrange the rolls nicely and let them rise for another 30 minutes. In a bowl, add 1 cup warm water and 2 tbsp yeast and whisk until the yeast dissolves. After that pour the oil and sugar, mix together and let it rest for about 5 minutes. If the yeast is good, the mixture should make a lot of bubbles. Now add the egg as well and mix again. Mix 3 cups of flour with 1 tsp of salt and add it to the yeast mixture. If the dough is too sticky, add a bit of more flour. Let it rest for 20 minutes or so. Get your 2 apples ready, peeledm cored and shredded. In a small bowl mix 1 cup of brown sugar with 1 tbsp cinnamon. Chope your pecans as big as you want them. Roll the dough into a long rectangle that’s about ¼ of an inch (0.6 cm) in thickness. Melt some butter in a small bowl and brush the dough to cover the entire surface. Sprinkle in order, brown sugar and cinnamon, shredded apples and pecans. Fold this thing with the side that's furthest from you and pinch the ends together. Butter your dish very well, arrange the rolls nicely and let them rise for another 30 minutes. Bake it for 20 to 25 minutes and enjoy. To make the icing, just whisk all the ingredients together. wow this looks amazing! you make it look so easy!